Best carve out a road trip on the second or third weekend of October, leaf peepers of California. Best carve out a road trip on the second or third weekend of October, leaf peepers of California. Pictured: Lobdell Lake Road on Oct. 2, 2017. THERE ARE THOSE LEAF PEEPERS... who keep the car gassed up, and the snack bag fully snack'd, and the suitcase by the backdoor, packed and ready for the trunk. Then there are those lovers of autumn hues who kind of play it by ear, or, rather, by eye, just waiting to see how the annual roll-out of fall foliage goes. No suitcases are packed, the car might be nearing empty, gas-wise, and snacks can be procured along the way. If you're in this second group, no judgment: Life keeps a person's dance card pretty full, and something as lovely and as fleeting as the yearly fall show can be forgotten until the last minute. But, for Eastern Sierra regulars, that last minute is coming, at least for 2017, though worry not that you've missed it. Reports coming from the area, which is famed for its golden aspens and oaks and cottonwoods, among other beautiful trees, is that the leaves are really picking up steam. The suggestion? BE THERE... over the second weekend or third weekend in October, if you can, for the full, at-peak, it's-all-happening display. Lobdell Lake was looking might golden as October began, and the "...colors are really starting to blaze" around June Lake Loop, per Double Eagle Resort. 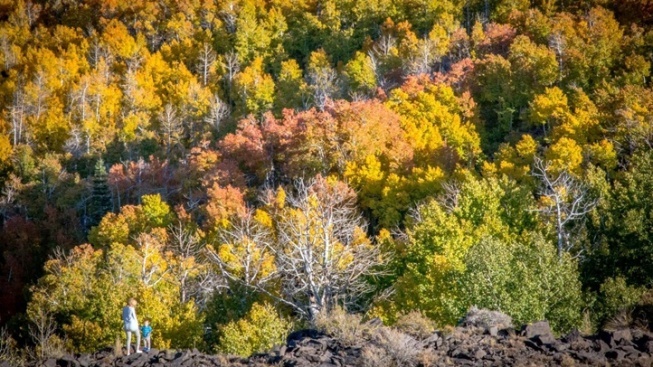 Take a look at the California Fall Color blog at what the latest is around Mono County and Inyo County (several swaths are at full gamut in the first week of October 2017, meaning they're either just starting or about to wrap up peak color). In other words, best gas up, pack up, and de-snack the pantry ASAP should you want to catch this year's Eastern Sierra spectacle.